I'm sorry I didn't comment earlier. eYe, thank you for all you've done for us throughout the years - you're one who has contributed to practically every aspect of the community that I can think of. So it's entirely understandable that you don't want to spend so much time on so many things. I can offer some technical knowledge in installing, configuring, troubleshooting and maintaining a server (on a Windows OS). I can help with that and put enough time into it although I may need to learn a thing or two along the way. For SSM I have no experience and not enough knowledge, but I understand the principle and I could learn this. However, as far as I know it's somewhat time consuming which I'm not very enthusiastic about. If we decide to build and host a server at someone's home I can help with choosing appropriate components and with overclocking, which can improve server performance (mainly map loading time) beyond what most server hosting companies offer. So, to give you a sense of the benefits of this, while the companies normally offer servers with CPUs that can go up to 3.9-4.4GHz, with overclock we can reach maybe about 4.5-5.2GHz and the map loading times would go down proportionally. So, with a custom build and overclocking we could get perhaps about 15-20% more speed for hardware that costs about the same as what it costs to a hosting company, or get about the same speed from much cheaper hardware. I can also offer to host such a server at my home, where I can contribute a decent CPU cooler (air cooling, good for a medium overclock) that I currently don't use, and I can share my current internet connection. It's supposed to be 15Mbit/s upload (as much as E-3's) but in practice it goes up to over 30Mbit/s in at least some parts of the day/week (that's the test result I get now). As far as I remember we played with about 50-70 players on this connection with Bluedrake42's crowd and the bandwidth was enough. Where I live there are many great choices for internet connections that are fiber-to-the-home (my former ISP), fiber-to-the-curb (current), ADSL or cable; at high speeds and good prices. So, if we decide that we want it I could get a second connection installed for a higher bandwidth and redundancy but I would ask for someone to pay the bill (it would cost something like 10 Euros per month and usually free installation). If I am to build a server here I could buy hardware at OK prices (no tax). I could provide a Windows OS at my responsibility. We can discuss more specifics if we decide that a custom server build is a viable option. One drawback about hosting at my location is that most of the players would get about 10-30ms higher ping, except perhaps those in Eastern Europe, Asia, etc. who may get a lower ping. About the increase of server disputes - this is something which I haven't fully witnessed, because I guess the admins discuss things such as bans mostly in closed forums or privately, and severely limit public discussion. This is something which I don't like and would like to see changed if I'm to be significantly involved with the server. Specifically, I think the information about bans - evidence, who banned who, etc. should be public, open for discussion and kept permanently. I don't know how decisions about bans are made now, but banning with the support of just one or two people, or even more but with important dissenters or absentees (due to non-public proceedings), would not be good. @timothyhughes109 It is very nice that you are offering something. I guess it's a matter of finding someone trusted and responsible and also someone offering certain skills and services (such as server-side modding, solving technical problems; I guess it could be multiple people). Those things seem harder to find here than a server hosting and custom maps which you said you offer. So I guess it would help if you list the things that are being offered, e.g. since Forgotten Honor already has a server I guess you have someone who can set it up and configure it, etc. - is that you? Also, exactly what CPU does the server run on? Yes, I have managed the all Forgotten Honor Battlefield 1942 servers for a couple of years now. If I ever have a serious server issue, I have a experienced support staff which are responsible for all Forgotten Honor servers. We have two boxes that run our various servers for multiple games, so the expenses for a server are always prepaid under our general community donations. As we operate our own box, there are no additional costs to having a server, we already have 2 in Battlefield 1942 campaigns, 1 of which could by easily converted into a public server. As for my experience here in the FHSW EU community, I have been here since 2013, before the partnership between FHT and FHSW Europe was established. Robert and many others here can vouch to whether I am dependable or not. The CPU for the server is 3392 at present. Similar to FHSW Europe's 3350 CPU. Buddy, then why didn't allied and axis teams have both servers ready for training's last campaign? Both of our teams had to train on the one active server sometimes with unchanged map from previous week with no admin responsible and you not being around. I am just asking...., because before the campaign finished, I didn't get any answer for this question. Because I was on a pre-declared trip for two weeks, and the Officers with delegated powers kept forgetting their login information or not wanting to upload because of the map not being biased or interpreted as balanced in a way favorable for their team. But that was not for the majority of the campaign. Again, Forgotten Honor was undergoing a hacking crisis last summer, and most admins were busy with making the new website to combat this. Perhaps I could have cancelled my RL plans (...) if I had realized how dependent everyone felt on me. Also was kind of a moot point as HQ kept canceling those trainings due to attendance. But site admins here requested this topic to pertain only to future server ventures. Bubu, I know you are unhappy with FHT for banning Korsakov, but I am trying to keep this conversation productive concerning solutions for the Forgotten Hope Secret Weapons community. This is not at all about me, nor my feeling towards FHT for banning Korsakov, I am not trying to fight FHT. I am trying to prepare people of this community for everything that can happen if server is switched over to you guys in FHT. I am basically showing everything negative you forget to mention every time...but I am leaving the others to make their own judgement. Ok, well that issue was merely pertinent to the training server when I was on vacation and the officers apparently didn't upload the server was I away. This is probably due to the fact that the officers weren't that interested in holding trainings during the week that conflicted with player's schedules. We never had cancelled a battle in the last few campaigns. So on the days that players actually played en masse, the server was always up and working. But this isn't relevant to a public server. Due to the fact that trainings are small scale events organized by officers about possible map changes, times in training are flexible. 1. We will not be constantly loading new maps every few days and massively changing server settings. Due to the changing nature of balanced maps, this is what occurs during tournaments, which widely contrast with a 24/7 public server. 2. Hopefully, some of the current FHSW Europe server admins will agree to stay, so the server can be managed even if I am not present 24/7. 3. Due to the fact that there will be no major constant map changes, the server will be able to run 24/7 without these updates. As you can see, the "issue" with the training servers during the campaign were merely an internal campaign prerogative established by the officers. Forgotten Honor is currently running several considerably active public servers (constantly 64+ players) for Battlefield 1, Project Reality, Planetside, and other games, all without major server side issues. We have a 12 year precedent of successful experience with the Battlefield series. Some internal changes during the summer does not effect this in the present. We are more than willing to offer a helping hand in trying to bring players together with a great experience for all. fiber-to-the-home (my former ISP), fiber-to-the-curb (current), ADSL or cable; at high speeds and good prices. So, if we decide that we want it I could get a second connection installed for a higher bandwidth and redundancy but I would ask for someone to pay the bill (it would cost something like 10 Euros per month and usually free installation). If I am to build a server here I could buy hardware at OK prices (no tax). I could provide a Windows OS at my responsibility. We can discuss more specifics if we decide that a custom server build is a viable option.One drawback about hosting at my location is that most of the players would get about 10-30ms higher ping, except perhaps those in Eastern Europe, Asia, etc. who may get a lower ping. does that isp give a dedicated ipv4 address ? my isp ziggo does not say anything about future plans they got for my ipv4. they have a DS-Lite connection ( aka shared locked down ipv4!) however ziggo does offer business internet that has dedicated ipv4 address but at very high cost. and can be setup on a custom computer that run fhsw optimally way better as any dedicated paid service. also dont think that they can transfer accounts to new host. Hopefully we get more detail soon about the server from Eye. I might take over the server, so we can keep the IP, depends. Thanks for your offers, honestly I would prefer to keep the current server so ppl are not confused when it's suddenly gone. It would be better for the community I think. If no one wants to take it then we (or rather you) can think about using a new server. I've asked hetzner, it's a fairly simple process, I just have to change the e-mail and personal info which is stored in the hetzner web-interface (https://robot.your-server.de) and pass on the login data. so who is passing the fhsw torch now ? Thanks for your offers, honestly I would prefer to keep the current server so ppl are not confused when it's suddenly gone. It would be better for the community I think. If no one wants to take it then we (or rather you) can think about using a new server.I've asked hetzner, it's a fairly simple process, I just have to change the e-mail and personal info which is stored in the hetzner web-interface (https://robot.your-server.de) and pass on the login data. Sry but, So what are you saying? 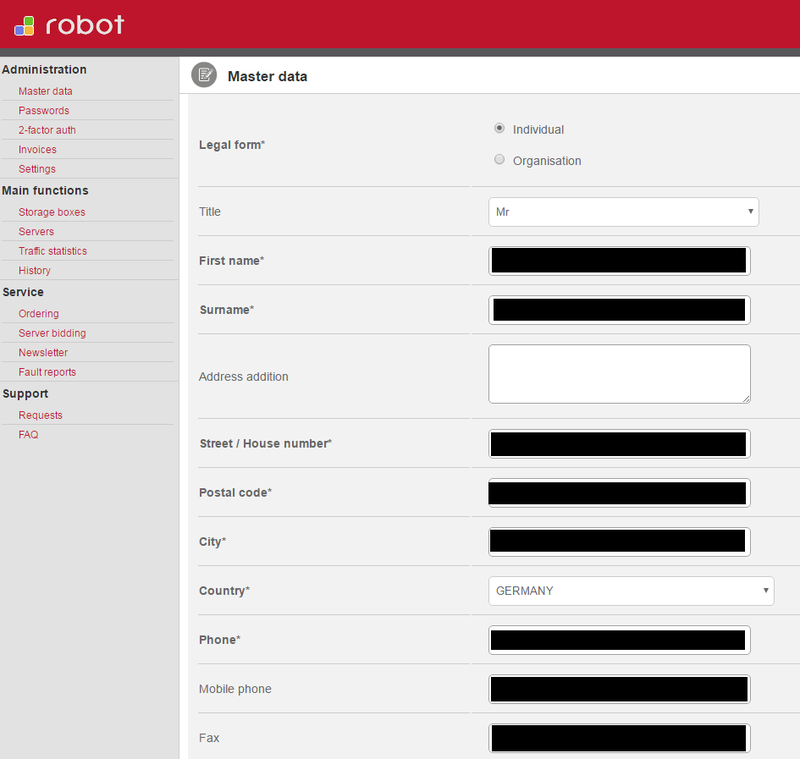 and give you the login data to the "robot" and server. can you post a link with the obligation, of keeping up with it responsibility? When does the contract expire? Who is taking over? Or do we go online one day and "This Page Cannot Be Displayed" and no server listed in FHSW? If that be the case, thanks for the time I was able to play here, 5 months. The players here are good players and it will be sad to see the last worthwhile BF mod server go down. Probably also means the end of gaming for me. Probably yes, I haven't gotten any mail from them so far. I don't understand this sentence, sorry. I won't shut it down until we have found a new server or owner of the current one. Quotesonikglight ()can you post a link with the obligation, of keeping up with it responsibility? There is a contract with the server, i like to read it, can you post a link on it. birth certificate? wtf they need that for? I guess they want to know who they're giving a server. They're not allowed to ask for the ID card because it's forbidden by (German) law to make a copy of that. But I prefered to sent them the driver's license copy. You don't have to do that anyway since that's only necessary for the inital setup I think.